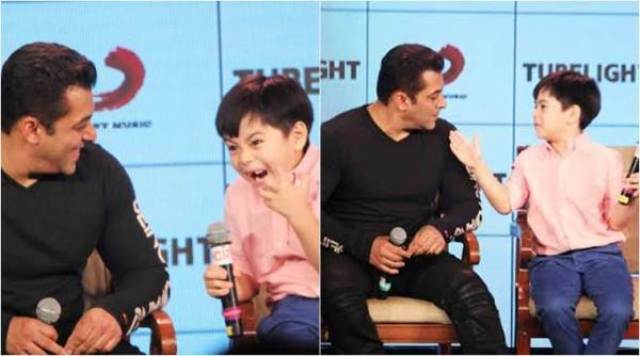 5-year-old ‘Tubelight’ actor, Matin Rey Tangu from Itanagar, Arunachal Pradesh gave a befitting reply to a racist question raised by a Mumbai-based reporter during a press meet to promote the movie, four days before the film’s release, here on Monday evening. The star kid from Arunachal Pradesh who starred along with superstar Salman Khan in the upcoming movie – Tubelight was introduced to the audience with Salman Khan going all out praising the young star. Known for his sharpness, the 5-year-old kid left the reporter red-faced with his reply to a rather foolish question. During the meet, a reporter asked Matin if this is the first time he is visiting India, assuming he is Chinese. The journalist was corrected by another scribe sitting beside her, who told her Matin is from Arunachal Pradesh. The boy, who had already by then left the media persons in awe with his sharpness, replied, “Hum India per hi baithta hai, toh India mei toh aayega na (I live in India only, so obviously I will come here),” as the crowd emerged in cheers and applause. Tubelight is set against the backdrop of 1962 Sino-Indian war and Salman’s Chinese co-star in the film is actor Zhu Zhu, who is making her Bollywood debut. She hasn’t been to India yet for the promotions and director Kabir Khan has said that her India visit will only happen after the film’s release. Tubelight hits theatres this Friday.